"It's just Scotty on the guitar!" Those were the words of my flatmate, Roland, back in the summer of 2007. It was a phrase he repeated on several occasions. And it was true. It was just Scott and his guitar. A quiet man, performing his passion for a room full of adoring friends/fans. Frightened Rabbit came into my life a year earlier with my best friend Alan introducing me to their debut album, Sing the Greys. The record certainly caused a stir in the Glasgow indie music scene, as well as my own heart with Scott's brand of brutally raw but deeply honest lyrics striking all the right chords and providing a real alternative to the increasingly banal guitar music that seemed to permeate the mid 00's (Kaizer Chiefs etc). Scott was singing about rejection, about pain, about lost love. He wasn't writing music that "some c**t might like" He wasn't trying to appeal to any specific market or identity. He was writing his heart. Genuinely, creating art. Not for the masses, but for you and me. Performing his soul. A Frightened Rabbit out of his hole. 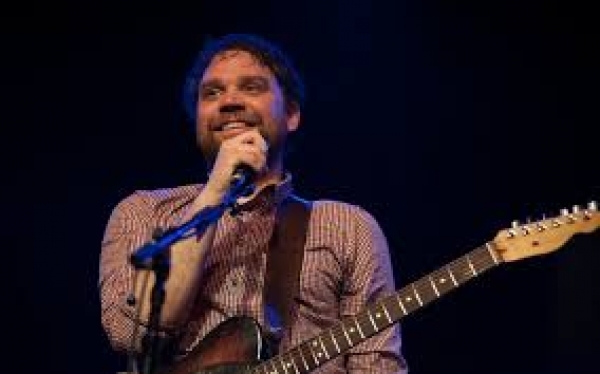 Frightened Rabbit began as a solo project for Scott in 2004 but with the addition of his brother Grant on drums and bass player Billy Kennedy, a brilliant 3 piece became a staple of the Glasgow music scene with The Rabbit regularly performing huge sets in tiny basement bars across the city. The performances were raucous, rambunctious and raw. Really, really raw. Both of the Hutchison brothers played with a passion and an energy that sucked you deep into their performance. They weren't standing for attention. There was no look at me histrionics as we so often see with young guys in bands. This was just music. Music Now. In the summer of 2007, I found myself looking for a new room in the city. I applied for a room online and arranged a viewing later that day. To my considerable surprise, the flat was occupied by Scott's brother Grant. After a quick 10 minute chat with both brothers, I discovered that the room was only available for 3 months but considering this was one of my favourite bands, I was hardly going to say no to the offer. I was now living with the drummer of Frightened Rabbit! And I was quite happy to tell them how great I thought they were. Maybe I just wanted the room (it was HUGE), but having spent the previous 12 months falling in love with Sing the Greys and seeing the band perform live on multiple occasions, I had no problems telling them how much I liked their band. They didn't seem to mind, to be honest. I'm not sure that adulation was something either of them ever sought or really desired. Later that week the boys told me they would be having a party in the flat and it was on that occasion, that one of my two never-ending memories of the band would come to life. It was during this period that the band were in the production stage of Midnight Organ Fight and I had the outstanding fortune of being one of the first people outside of the band to hear a copy of that album, at the demo stage. I already knew what was coming. I was in love. Midnight Organ Fight would go on to be by far their best and most successful album. It was the album that as Scott said "would give them their career". What a record. From start to finish. Almost perfect. And so to that memory. Party fading down. 20 people in my bedroom. Smokes, drinks, and finally, just Scotty on his guitar. "MODERN LEPER! DO MODERN LEPER!" Scott Hutchison, in my bedroom, with me and my best friend Alan, Roland repeating "It's just Scotty on the guitar", nailing Modern Leper. Midnight Organ Fight had yet to be released at that point and here he was, performing Modern Leper, to a room of 20 drunk partygoers in his brothers flat. I already knew that this would be their signature song. Everything that made Scott who he was, how great his writing was, is encapsulated in those 4 minutes of music. It's always gonna be my favourite Rabbit song. It was then. It is now. And he performed it. Right there. It really is one of my most fondest of memories. And I was happy to thank him. I thanked him. I told him what a truly gifted and amazing songwriter he was. A lyrical genius. He really was. His use of imagery, his ability to convey a feeling or thought in a way that none of us had previously imagined, the way he could express the darkest of thoughts in a form we could all adore. That kind of talent cemented with real, genuine emotion, is rare and is something to be truly cherished. To see Frightened Rabbit perform live was always an experience. Anyone who has seen them live will attest that this was a group that loved music. That's all. They really loved it. I had the great pleasure of seeing them perform, both in my bedroom and in some of Glasgow's best venues. The reality that we will never again see that love is a bitter pill to swallow. Ultimately, all of our shared connection to Frightened Rabbit and to Scott is through his music. Through his ability to write down his feelings and belt out a performance. Heart, fire, passion, desire, pain, and torment. Scott had it all. And he shared it. For that, he will always be loved. And for that, he must be admired. I can't pretend that I knew Scott well. I only lived with Grant for 3 months and while Scott was there most of the time, he was generally a quiet man who kept himself to himself. Through the passing of time though, I have come to realise that I actually had quite a lot in common with Scott. Both from Scotland, around the same age, writers (i'm not in his league I'm afraid) and sufferers of depression. We didn't have too many conversations during that period but I am proud to say I met the man, I told him how special his music was and I heard him play my favourite song in my bedroom. Not many fans can say that and for that, I am genuinely grateful. There's so much more that could be said about the man, about his music, about the feelings he gave all of us. but I'll leave you with that second memory. And then the other Ryan intervened. (SKIP TO 1.50) "It's got lots to do with magnets and THE PULL OF THE MOON"
You can quite clearly hear my good friend sing along with far too much gusto but Scott took it in his stride. Laughing along, replying, mid-song "that's f*cking awful!!" and creating the kind of atmosphere that people never forget. This wasn't his moment. This was OUR moment. A shared, collective embrace, where music and it's kinship is so distinctive, so unparalleled, unrivaled in its ability to make you warm inside. Scott leaves us far too soon but there can be no doubt, that he provided us with more than just "tiny changes". Scott leaves our world with a legacy of brilliant music, pain, but ultimately, of love. Thanks for the memories Scott, truly, you will be forever missed. Thanks for the memories Ryan!